Maurizio Sarri: Has Kepa Arrizabalaga's cup final defiance fatally undermined Chelsea boss? 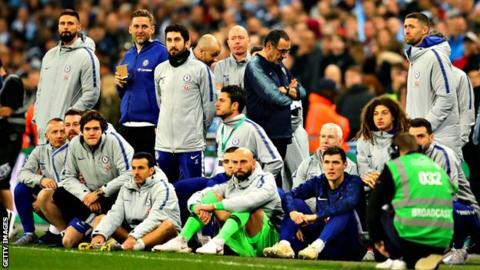 Maurizio Sarri left Wembley not only nursing the pain of a Carabao Cup final loss to Manchester City but with every shred of his authority and a large slice of his credibility as Chelsea manager stripped away by a disgraceful act of insubordination from goalkeeper Kepa Arrizabalaga. This dull final was destined to linger only briefly in the memory until an unsavoury, unprecedented series of events that must surely leave Sarri, already fighting to survive at Stamford Bridge, fatally undermined. It is often said that nothing surprises in football - but the sight of a £71m goalkeeper bluntly refusing to obey his manager's orders to be substituted in a major Wembley final writes a fresh page in the book. Sarri, on an even keel after his earlier ranting incandescence, later blamed the incident on a "misunderstanding" - a defence few were buying based on the evidence of their own eyes. Kepa had been treated twice for cramp during extra time before Sarri decided he had seen enough and tried to send on former Manchester City goalkeeper Willy Caballero, who famously saved three shootout penalties in the 2016 final as City defeated Liverpool. Instead of coming off, Kepa simply stood his ground, wagging a disapproving finger in open defiance of Sarri who, as the situation descended into complete farce, allowed this flagrant display of player power to win the day. Sarri looked on the point of spontaneous combustion, stalking towards the tunnel doors to the dressing rooms before returning, and then being restrained from challenging his goalkeeper by Antonio Rudiger as the team and coaching staff convened prior to penalties. It was an ugly rebellion that exposed all the fractures in Sarri's Chelsea regime - and was a new one even on those of us who have travelled the world and seen most things the game has to offer, good and bad. Chelsea's loss is almost a side issue to the questions raised by Kepa's behaviour and the damage this has done to Sarri inside his own dressing room and even higher up inside Stamford Bridge. Let's get one thing straight. The first fault lies with the player - if you are told you are being substituted you go off. You may not like it but you go off. Referee Jonathan Moss was forced into a new role as technical area mediator between manager and player as confusion reigned. That Sarri put it down to a nothing-to-see-here "misunderstanding" was all very commendable, but the horse had clearly bolted. This was a very painful, public indignity and will surely have been noted in red ink in Chelsea's corridors of power. The problem for Sarri, and the matter that will trouble owner Roman Abramovich and Chelsea's decision-makers, is that this unseemly episode made the Italian look weak, indecisive and, for all the conciliatory noises made afterwards, lacking in control at a time when he needs to reassert himself. And for all the talk of breakdowns in communication, attempts at damage control only confirm the utter shambles that was unfolding on and off the pitch. Where were the Chelsea players telling Kepa to respect his manager's wishes as the public row went on? David Luiz claimed that was his precise message to his team-mate, but there was hardly a rush to enforce Sarri's very specific demand. Why did Chelsea captain Cesar Azpilicueta not suggest to his fellow Spaniard that Sarri's word is final, whether he liked it or not? And what about Caballero? How will he feel about the sorry mess in which he found himself an unwitting participant, left staring at his feet in embarrassment? Put it all together and you are confronted with a staggering show of disrespect. Kepa could have made amends in the penalty shootout but his only save was from Leroy Sane - having already allowed a tame Sergio Aguero effort to squirm under him - before Raheem Sterling's ferocious finish gave City a 4-3 win. Sarri was on a salvage job post-match, but this is surely a decisive moment. How can he possibly regain his authority and respect in the eyes of his squad, supporters and perhaps, most significantly, upstairs at Chelsea when this unfolded at a crucial stage of a major final? They were the sort of scenes, misunderstanding or not, that would embarrass a Sunday League team let alone one with designs on operating at the game's elite level. Of course 24-year-old Kepa must take the biggest share of the blame, but football and financial realities dictate that the main suffering will be heaped upon the beleaguered manager. If football operated by normal rules Kepa would be in the dock and his Chelsea career would be on the line. Instead the spotlight is on Sarri. Sarri's fury will be made worse by the fact he and Chelsea got so much right. He stifled City with his smothering tactics, saw his side grow in this final and his substitutions showed real intent with Callum Hudson-Odoi replacing Pedro to build on periods of supremacy. There was even a departure from tradition when Ross Barkley was replaced by Ruben Loftus-Cheek, not Mateo Kovacic. This had actually been a good day for Sarri until chaos took over but once defeat had been confirmed, Chelsea's miserable week had just got worse. Chelsea had tamely exited the FA Cup at home to Manchester United on Monday then the club was banned by Fifa from signing players for the next two transfer windows for breaching rules in relation to youth players. Capping this shocking spell with a Wembley defeat is bad enough - topping it off with open mutiny only compounds the gathering sense of finality for the beleaguered Sarri. Chelsea produced a performance that might have sustained their manager in his post. What unfolded at the end only leaves Sarri in greater peril.